[I]n 2013 the Pawlenty plan would give people in the top one-tenth of 1 percent on the income scale (i.e., people with incomes above $2.7 million) an average annual tax cut of $1.8 million — which is more than four times what they got last year from the Bush tax cuts. Again and again, who in a sane mind believes that the GOP is out for the middle class guy? Unless by middle class you mean millionaire. 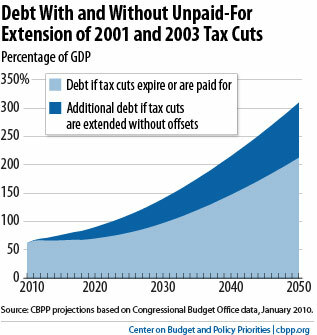 Still For The Bush Tax Cuts? Here are a ton of reactions to the Obama tax cut deal as well as takes on it from the Republican side. Thank you Obama for compromising on this issue and establishing a bipartisan solution. You have shown that you are man enough to put through this deal, bend backwards a bit with extending tax cuts to millionaires and billionaires, and see it as a work in progress in that requires both sides to be included. He didn’t choose to be a bitter sissy who didn’t get his way and waste the other 300 million American’s time and money as he regained his composure. Amazingly, the nihilist party of “no” made this deal happen when they could of waited a bit longer until their new Congress came in with a House majority. On another note, I really don’t know how a normal middle class family or individual could honestly vote for these Republican fucks. They pander to the millionaires and billionaires and will only grant a permanent tax cut for the middle class if the upper class gets one first. Let’s keep in mind that permanent tax cuts for both classes are completely unrealistic and unsustainable. “We knew that, politically, once you get [the Bush tax cuts] into law, it becomes almost impossible to remove it. That’s not a bad legacy. The fact that we were able to lay the trap does feel pretty good, to tell you the truth,” – Dan Bartlett, communications director under George W. Bush. The term “tax cuts for the middle class,” which Democrats like to use, has misled. As you can see from the left side of the chart, the “tax cuts for the middle class” also cut taxes on the rich. A family that makes $750,000 a year would pay lower taxes on the first $250,000 of their income. The question has never been whether only middle-class workers should get a tax cut. It’s how much income the tax cut should cover. The president’s plan would be taking an unnecessary gamble with the struggling recovery. Businesses have only recently begun to add jobs, and they appear to be a long way from hiring fast enough to reduce unemployment. Even under the best of circumstances, the unemployment rate will remain near 10 percent well into next year. The high rate of joblessness has cast a shadow on the collective psyche that will only worsen with higher taxes, raising the already uncomfortably high odds that the economy will suffer a double-dip recession. Successful small-business owners, who power the nation’s job-creation machinery, make up one-third of these high-income taxpayers. They have set up their businesses so that their profits are taxed at personal rates. Raising marginal tax rates, even a little, on those who have suffered during the past several years would be a mistake. I didn’t know that the small business owners make up one-third of this “rich group”. Zandi’s piece has me rethinking some of this debate, but merely because of the fragile economic state we are in (not in theological terms). 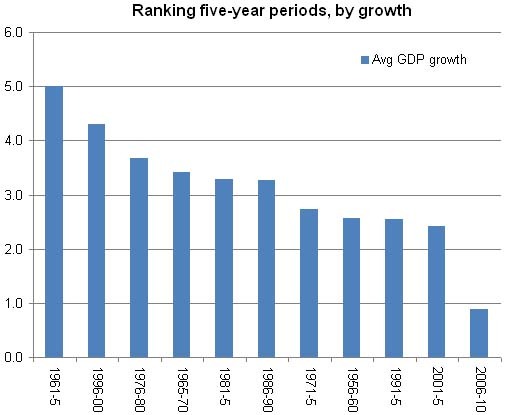 Given this history, why should we believe that the Bush tax cuts were pro-growth? I had a light bulb moment as I was reading this blog post last night. Advocates of incessant temporary infusions of cash into the pockets of low- to middle-income people in the hopes that they will go out and spend it and “spur demand” and thus create incentives for businesses to invest and expand and hire sound, to be quite frank about it, totally out of their minds. How many times must they be reminded that businesses invest (and banks lend) with an eye toward long-term economic prospects, asking themselves, “What kind of return am I going to get on this investment over the long run?” Temporary blips on the demand radar of the kind that fiscal stimulus represents do not factor into this decision-making process at all. The mindset that we give a boatload of money via the Recovery Act to a bunch of sectors of American in hopes of re-energizing things sounds strikingly similar to the case made for keeping the tax cuts for the rich. If the tax cuts for the rich stay, the rich will get richer and as they were implemented in the Bush II years, they didn’t yield the results (more jobs, better economic conditions) to prove that, if extended, they could help put that money back into the economy. A lot of this is addressed, and well linked, here and here. In the end, it looks to be a similar case of “use government here for Pete’s sake!” here and “don’t you dare use that devilish government!” there.